The rise in the number of refugees in the Ukrainian conflict is resulting in one of the world’s “worst humanitarian crisis” today, the UN has confirmed, as sporadic fighting and a lack of aid forces civilians flee to neighboring countries, mainly Russia. The number of Internally Displaced Persons (IDPs) and those seeking refuge abroad is reaching catastrophic proportions despite the February-implemented Minsk II ceasefire agreement which barely holds ground with intermittent fighting continuing in the Donbass region. The latest statistics from the Office of the UN High Commissioner for Refugees (UNHCR) show that some 857,000 Ukrainians have sought asylum in neighboring countries. That is an increase of about 23,000 people in the last two weeks. “The situation seems to be getting worse,” William Spindler, UNHCR Senior Communications Officer for Europe, West Africa, Statelessness told RT. He says that the number of IDPs and refugees from Ukraine has surpassed 2 million people. He added that people in Donbass continue to live in “substandard accommodation” as a result of the ongoing fighting. “1.2 million people have been displaced inside Ukraine and over 800,000 people have gone to neighboring countries,” Spindler said, confirming the latest figures disclosed by his office. He added that those fleeing to neighbouring countries have gone “mainly to the Russian Federation” as well as Belarus, Poland, Germany and France. In the latest report on the Ukraine conflict, the UN Office for the Coordination of Humanitarian Affairs (OCHA) estimates that between mid-April 2014 and 14 May 2015, at least 6,334 people were killed and 15,752 wounded. It also reported a danger posed to civilians by “unexploded ordinance and landmines” that are still left in Donbass. “The situation is very serious, very worrying. This is one of the worst humanitarian crises in the world today,” Spindler said. The lack of medicine and medical equipment in conflict areas in Ukraine poses great danger, OCHA reported earlier. Both humanitarian and political efforts on the ground by the parties involved need to be “stepped up,” Spindler says, in order to reverse the dire situation that resulted from Kiev’s ongoing so-called “anti-terrorist operation” in eastern Ukraine. “We are distributing essential aid but our efforts are not sufficient to deal with the needs,” said Spindler, stressing that more funding is needed to continue humanitarian aid work as the current financing covers only some 40 percent of the organization’s mission to Ukraine. 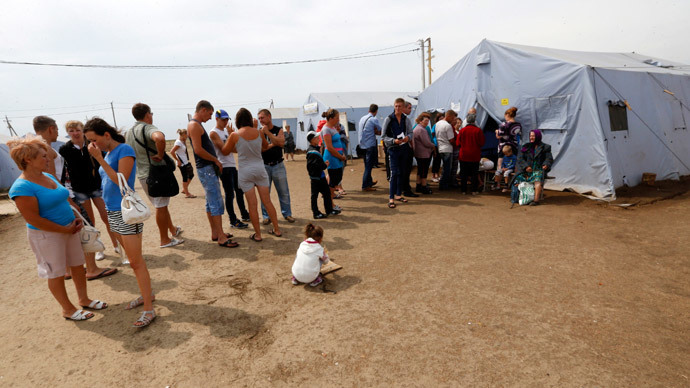 Russia meanwhile continues to receive refugees from Ukraine, accommodating those seeking shelter in refugees camps before helping them settle all across the federation. “During multiple visits to a refugee center for Ukrainians we did not notice any problems with accommodation, food, medical services and education. Everything is organized as it should be, on the same level as for Russian citizens,” UN Refugees Agency (UNHCR) representative in Russia Baisa Vak-Voya told journalists Monday. At the same time, Federal Migration Service chief Konstantin Romodanovsky called the situation in Ukraine a humanitarian disaster, as up to 600 Ukrainians cross into Russia daily. “It is a catastrophe, of course. Homes have been ruined there. People vote with their feet, leaving their home country and entering Russia, where they get the status of temporary refugees – not because this is something Russia wants, but simply because there is no place they can live in,” Romodanovsky told Interfax on Monday. Russia meanwhile estimates that over a million of Ukrainians have entered Russia since the conflict began last year, according to Valentina Kazakova, head of the Federal Migration Service’s Department for Citizenship. Out of that number some 350,000 have applied and most of them granted temporary refuge status. “Another 105,000 have applied for entrance onto the state program for assisting the voluntary resettlement of compatriots from foreign countries,” Kazakova told Interfax earlier this month. Since the conflict began another 195,000 Ukrainians requested temporary residence permits in Russia, while 40,000 applied for permanent residence cards and 88,000 for citizenship.